Equipment costs can be one of the first major investments any student has to make into his or her HEMA studies. Below are requirements for students. Don't let the price estimates discourage you. This list is intended to give students a long-term impression of the costs they might expect so they can save up for quality equipment, rather than go cheap and have to replace it with better equipment down the road. Not all equipment needs to be purchased right away, so please drop by and talk with us about your equipment needs. We have plenty of loaner equipment for people who are new or in the process of saving up for their own. This is the bare minimal equipment requirements, allowing you to do partnered drills and maybe some light sparring. We have gloves and masks to loan new students. This equipment will suffice for beginners, though equipment requirements are greater after the beginner phase and at HEMA events. Flat-soled shoes are highly recommended for rapier. Protective gear and simulator requirements vary depending on training and curriculum. Generally, during typical drilling, a mask, gorget, and gloves are usually all that are required, though under some conditions other gear may be necessary. This set of equipment will allow you to eventually work most full-speed drills and sparring. Not all HEMA students are interested in tournaments. Even in TSG, we have some who are more interested in competition than others. For those seriously considering competition, in addition to the standard set above, the following are also required. Fencing masks must have back of the head protection for most all activities beyond beginner drilling. We recommend Absolute Force's HEMA Helmet as many in our club have used these over the years with good results. PBT also makes a line of fencing masks designed for HEMA. Note: We do not recommend purchasing Absolute Force's HEMA glove. 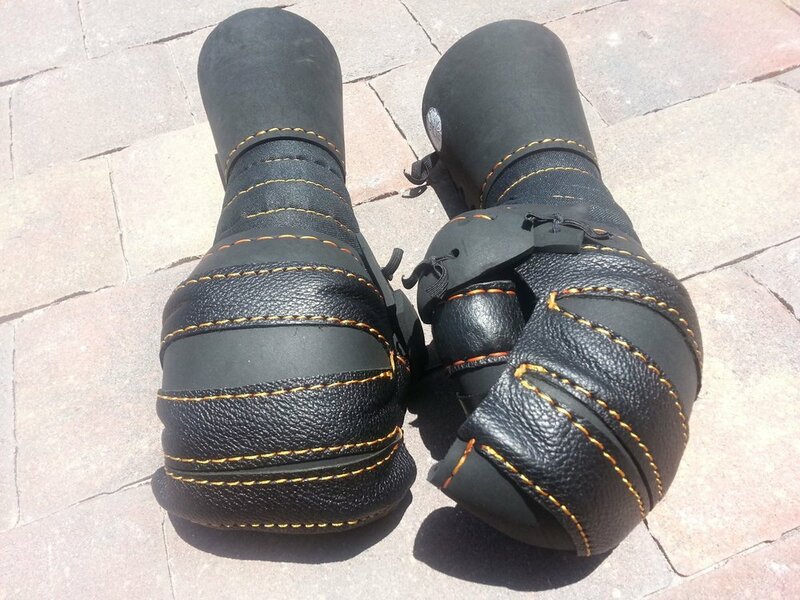 Over the years, we've seen consistent injury in these and so we'll no longer allow members to spar in them. These are the best cheap option available, though many lacrosse/hockey gloves still impede the hand's proper motion and fail to protect perfectly. We recommend buying gloves used (from Play it Again Sports) so you can try them out first and make sure they fit and move correctly. Look for gloves that have hard plates on top of the foam, for extra protection. If you can find gloves with protection for the tip of the thumb, all the better. LAX gloves should be reinforced with leather to provide better protection. Talk to us about requirements for reinforcing gloves. Price: $50-$80. Neyman fencing has a few different HEMA glove options, all with highly customizable leather and stitching options. Our experience with them so far has been favorable and we highly recommend these as an over-the-counter option for those interested in something more protective than lacrosse gloves. The Thokk gloves and lobser style gloves are both quite popular, and come in the 140-160 Euro range (plus shipping). SPES is one of the preeminent suppliers of HEMA equipment. Their gloves are a hard plastic lobster style glove that offers pretty significant protection to the back of the hand and most of the fingers. They are a little bulky but only slightly more so than other options. The thumb of the glove in is the only place where we've had problems as the design doesn't prevent compression damage on the finger, though it still protects well enough to avoid most serious injury. They're available through SPES's U.S. distributor. Price: $200. Chest protection is used to minimize injury to the torso and arms, and add a layer of protection against thrusts. We often drill without torso protection, but generally with heavy thrusting drills, we put them on. They are also essential for steel sparring. There are a number of options on the market today geared specially for HEMA. Some people also prefer a historic option, such as a gambeson. These will function perfectly well, though be sure they fit and allow for adequate arm movement. Many historic options on the market are made more for aesthetics more than function, especially cheaper options, and may not be suitable for HEMA. The AP Jacket was one of the first commercially available jackets designed just for HEMA and is still one of the most common. It provides a lot of protection, decent mobility, and is convenient to put on and take off. The jacket also comes in a version tailored especially for women. If possible, please consider ordering your jacket in TSG colors (either blue or black). We do not recommend the Pro version of this jacket. Price: $209 plus shipping. Neyman's jackets are newer to the market than the SPES ones, but they are easily up to the same level of quality and protection and are generally more customizable. They will also stitch your name and club logo on the back. Price: 200 Euros + shipping. 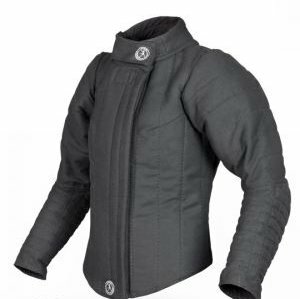 The Absolute Force jacket is a bit cheaper than the SPE or Neyman jackets, though the protection they offer feels a bit lighter as well, though the jacket perform well for what you need in HEMA. The back zip is also less convenient. Price: $189 + shipping. In terms of equipment, your sword purchase may be one of your biggest investments. We usually have enough extra swords to pass around if you need time to save up for your own, but it is still best that you work toward buying a sword for practice as soon as possible. Luckily, there are now a variety of fairly cheap blunt metal practice swords on the market. While we frequently used wooden swords in the past, we've found that they don't last as long or bind as well as many of the synthetic swords currently on the market. Many of our beginners begin with synthetics, though nothing compares to steel so we recommend that students save up for one instead of spending money on plastics. If you do buy a synthetic sword, we recommend the Purpleheart Type III Synthetics or the Blackfencer synthetics distributed by South Coast Swords. The Rawling synthetic longswords are half the price but are really only useful as a cheap solo trainer. An excellent practice sword at a decent price. They handle well, hold up to heavy use, and offer a significantly lighter strike and thrust than a regular blunt ($350). These are distributed by HEMA Supplies. 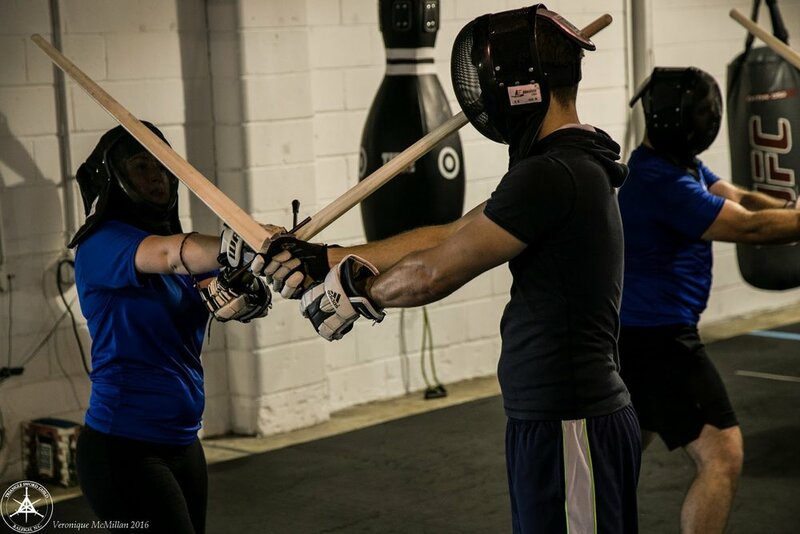 Another collection of superb, top-of-the-line HEMA swords, Ensifer blades are also highly recommended and are a mainstay in the HEMA community. Castille Armory is a company out of Oregon and while newer to the HEMA market, their feders are quite good. They offer a very basic sword that handles decently well and is durable enough. Their feder isn’t as agile as a Regenyei or Meyer, nor as pretty as an Ensifer, Albion, or Fechterspiel, but it’s a sold, workhorse feder. Neyman makes a feder that seems to have a decent reputation on the market now, like the rest of their equipment. We haven’t had a chance to try it yet, but reviews have been positive. Price: 270 Euros plus shipping. A great feder with nice handling and quality. Like most feders, this sword is much easier to control than a standard blunt. Price: $500. Hanwei Federschwert: We've seen a number of cases where the blade on these have broken and become a safety hazard. Starfire Blunts: While attractive, Starfire blunts are too heavy and poorly balanced for historical techniques. Also, most Starfires come with a point that is too sharp for safety. The blades listed below are indicated for all TSG rapier activities. While all of these are legal, some are better than others for specific kinds of rapier instruction. Ask your instructor for details. Danelli Armoury: All rapier and dagger blades. Zen Warrior Armory: T01, T03 (preferred), T05, T06. Flexidaggers are NOT permitted for sparring.